Perhaps you’ve passed by the 6th Avenue side of Bryant Park and noticed small groups of people tossing metal balls toward each other in one of our gravel areas? Well, those balls are known as ‘boules’ and the game is called pétanque. Usually grouped together in teams, each pétanque player strives to throw his or her boules as close as possible to a smaller wooden ball, the ‘cochonnet’. Similar to the game of bocce, pétanque is a popular European pastime that calls for precision, patience, and camaraderie. Our two Pétanque Courts start seeing action as soon as the temperature rises above 50 degrees, but official lessons will begin on April 12. As always, equipment and instruction will be provided free of charge. Members of La Boule New Yorkaise, NYC’s championship winning pétanque club, will return to the courts and provide free instruction to anyone who wants to learn. Instructors wear Bryant Park staff tags around their necks. Just tell them you’d like to play and you’ll be set up right away with boules, teammates, and expert tips on technique. 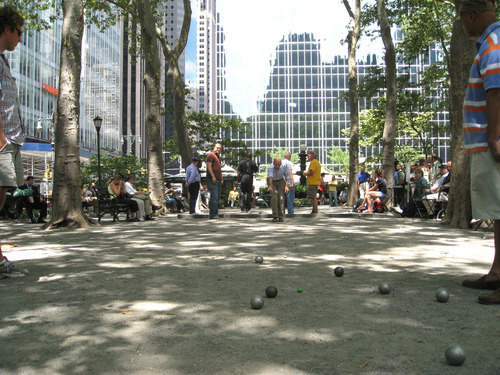 The Bryant Park Pétanque Courts are also available for parties. Contact us if you’re interested in making pétanque a part of your next office party or team building activity.